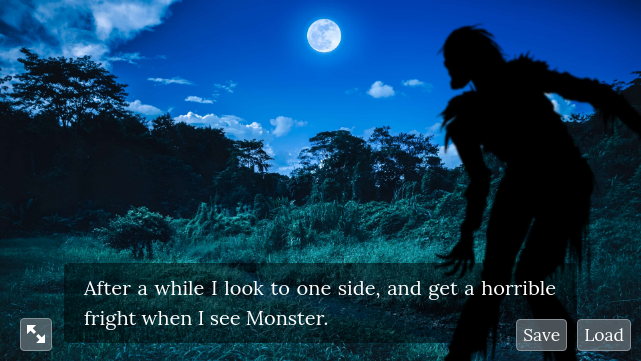 Monster is going to take Ruth and Kirsten to the dance. One Monster and two girls somehow works out as one Monster each. Alec wants a date for the dance too, but how is he going to get one when Monster is already taking both his favourite girls? Is he going to spend the whole evening with his date, or is he also going to save the other girl from Monster's cold and slimy kiss? 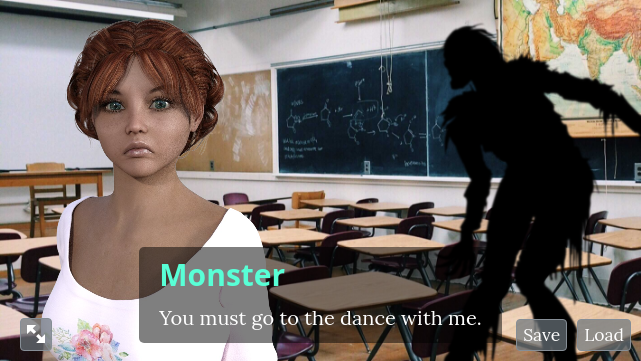 Dream is a visual novel made for the Maximum Monster Month game jam. Play as Alec and help Ruth and Kirsten defeat Monster. Dream is safe (and highly recommended) for work. You can play Dream on anything from a phone to a desktop. It’s been tested on Chrome (Android and desktop), Firefox (desktop only), Internet Explorer, and to a certain extent Safari on iPhone and iPad. If you use Internet Explorer, version 11 is required. When playing on a desktop, the game works much better if you use the fullscreen button (in the bottom left of the game window). I’m Pete Chown and I created all of Dream apart from the stock photographs. If you liked Dream, you should also like my traditional novel, Succubus, my short stories, and my previous text-only interactive story, The Interactive Cinderella.